OSWEGO, NY â€“ There is plenty going on at Building 30 in Fort Ontario Park. The entranceway concrete is cracked so badly, you can see the ground several feet below. Both groups would like to see more activity outside as well. The building that houses the two arts organizations is in need of much repair. 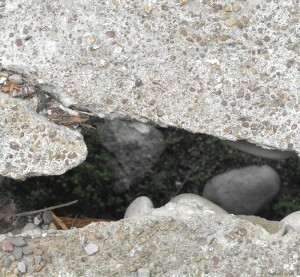 The city is looking at repair the concrete entranceway; there are large cracks in some sections where you can see down to the ground several feet below. At one end, the metal railing is falling off. In some places, the old building just needs a fresh coat of paint. Other areas are more cause for concern. 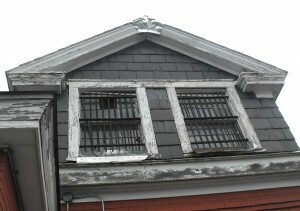 The flashing and sections of the slate roof are in disrepair. 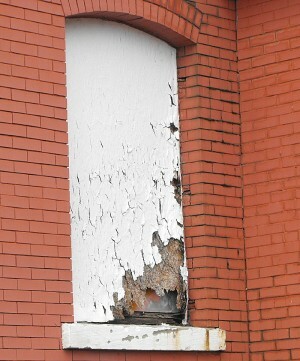 There are also holes rotted into the boards covering many of the windows. And, squirrels have gotten into the theater through a hole in the wall on the side of the facility. Because it is an historic building, it should be easier for the city to get grants to help maintain it, he observed. The covering on many of the windows on the ground level have rotted out. The building has been an arts center since 1964. With a tighter budget recently, the city is hard pressed to keep up with the maintenance. As part of the lease deal, the city is supposed to keep up the outside of the building. DPW Commissioner Mike Smith said he has discussed the issue with Second Ward Councilor Mike Myers. Finding enough funding for everything could be a problem, he admits. They have been doing odd jobs here and there, but hope the city will be able to kick in and help with the major repairs. The groups shut down for a while over the winter; that saves some on utility bills, but theyâ€™re still about $300 per month, Mahan noted. â€œSome of the cosmetic stuff could be done this summer. And then weâ€™re looking at, if everything goes well, the city working on the entranceway, the railing and some other areas during the winter,â€ he said. A broken out window pane allows squirrels, birds and the elements to get inside the building. The city used to pay the utility bills for the facility. Then one day they said they couldnâ€™t do it any more, she said. â€œWe had money in the bank a few years ago, a goodly amount. But you know how (utility bills) can be; this building is a cave,â€ she said. It is also making it tough on the art association, she added. The city should promote its arts more than it does, she said.